Oldham is situated in Greater Manchester snugly fitted in the middle of the city of Manchester and the stunning Yorkshire countryside. However, if you live in the town and feel like you are between a rock and a hard place when attempting to sell your car then you should get the process motoring by contacting WeWantAnyCar.com. Why choose WeWantAnyCar.com to buy your car in Oldham? There’s one reason why we are the UK’s favourite car buying service: we will quite literally buy any car. If you are worried that your motor is too old, in an awful condition or even a write-off then you’ve come to the right place; we’ll buy any car regardless. Moreover, we offer every customer a free valuation, full consultation and a fast and reliable payment service. It couldn’t be easier to sell your car to us. To get started enter your registration number into our valuation tool and complete the simple steps. We’ll then provide you with an instant valuation of your car and if you’re happy you can book an appointment at your local office to finalise the deal. Once the paperwork is completed and all documentation cleared we will have your money in your bank account. 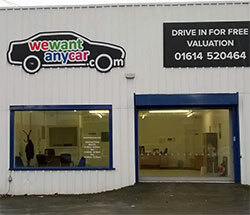 If WeWantAnyCar.com sounds like the car buying service for you then you can find us just moments from the M60 in the Hollinwood Business Centre on Albert Street. Call Michael on 01614 520464 or email oldham@wewantanycar.com or just drop by your local office for a consultation on your options. A didn't get the price it was worth. But a time when a needed money a was happy with what a got. But don't expect to get its true value. I had a Saturday afternoon appointmentband I was served by Phil Turner who was professional and very approachable. The whole process takes less than 30 minutes and I would definitely recommend to a friend. First class service I would like to thank Phil at your Oldham branch for a hassle free sale of my car. He was totally honest and upfront about the value and condition plus the whole transaction was completed in two days. I would not hesitate recommending We Want Any Car to anyone who wants a quick and simple sale. Give it a try it costs nothing for a valuation and there is no obligation or pressure to go ahead. Paid value advertised 100% on same day Easy to deal with Courteous and professional at all times. Though I didn't quite achieve the valuation that I wanted, I found the WWAC representative to be honest, professional and friendly. Phil Turner took the hassle out of selling my car. Honest and open transaction. No nonsense and money paid next day. Phil was a pleasure to deal with.